This heavy duty 8' x 10' tarp with reinforced tie down grommets is designed to cover and protect what's underneath from rain, snow and sun. 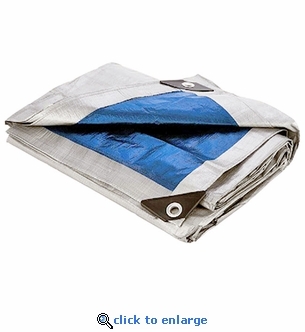 This all-purpose tarp with UV resistant silver exterior is perfect for covering equipment, hauling, camping shelters or ground cover and emergency uses. Rust resistant tie down grommets on corners. Weather and UV resistant silver exterior. Hemmed Size 7' 4" x 9' 6"